Syllabus of the Online Course (Subject): Corporate Social Responsibility, ethics and fight against corruption. Learning materials in (or Responsabilidad Social Responsabilité sociale). Corporate Social Responsibility (CSR) transmits the vision of a company towards society and environment. If the society has allowed the company to develop its business, the company, in some way, is indebted to society, beyond the existing legal requirements. Corporate Social Responsibility transmits the ethical principles and values of the company. The fight against corruption and human rights defence must be part of a company's Social Responsibility. “Businesses have a profound social responsibility that should be shown every day, not only through ethical business practices, fair and environmentally sustainable in all the aspects of an organisation, but also an active participation in the fundamental issues of society” Azim Premji (he had donated more than 25 percent of his fortune to charity). Many companies apply Corporate Social Responsibility as a mere declaration of intent (“because it is fashionable”), others because they are convinced to give back to society part of what it has given, and there are others, not many, which are including Corporate Social Responsibility as a fundamental part of their business strategy, directly influencing on its product/service development and/or price strategy. “I do not want to make money with these diseases that are causing so much damage to society.” PhD Yusuf Hamied (AIDS drugs of low cost). Indian companies are leading this change, as it will be analysed in the case studies of Indian Business People (PhD Cyrus S. Poonawalla, Tata Group...) These companies are designing products and services totally based on the vision of corporate social responsibility, which is closely related to ethical principles of Hinduism, Jainism, Sikhism, or Islam (Zakat is one of the five pillars of Islam). Investment strategy of Sheikh Mohamed Bin Issa (Saudi Arabia) is an excellent example of social responsibility application. 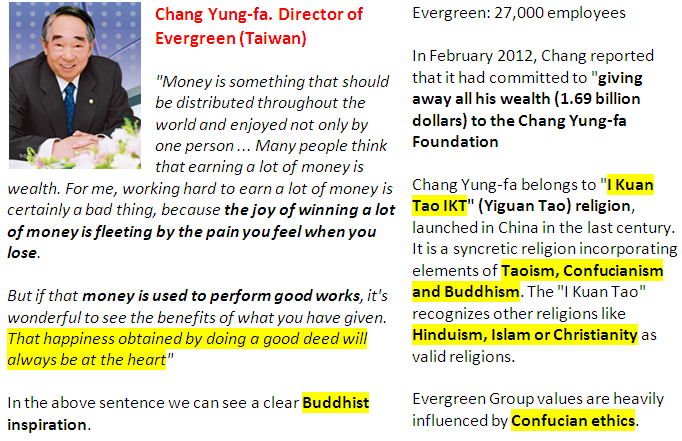 Under this point of view, the Corporate Social Responsibility can be seen in other markets, especially in Asian or Muslim Countries, more like a Western fashion than as a true attitude of the enterprise to society. It is also important to note the philanthropic work that many companies and businessman are undertaking as a part of their Corporate Social Responsibility. 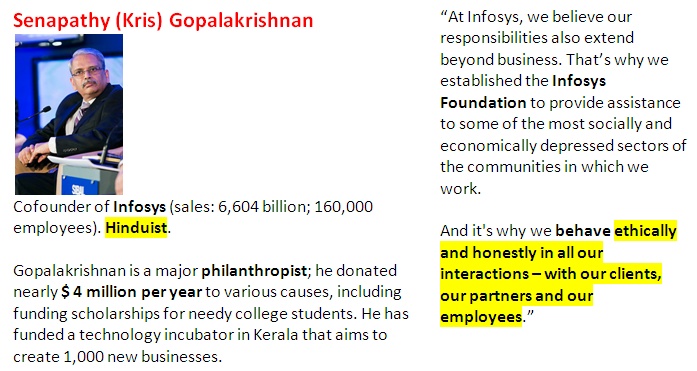 “Business is not just about revenues and profits, but also to help keep our earth green, our communities healthy and help children to be smart.” Adi Godrej (25% of the shares of Godrej Group are engaged in philanthropy. Either way; it is necessary to recognise the role that develops those businesses who apply Corporate Social Responsibility. EENI wishes to pay tribute to several business men and women around the world who are spending huge sums in philanthropic activities: Carlos Slim, Sahu Jain, Gautam Adani, Bhavarlal Hiralal Jain, Hinduja Group, Birla, Mukesh Ambani, Kiran Mazumdar, Kith Meng, Kazuo Inamori, Jyoti, Lee Kun-hee, Zhang Ruimin, Chang Yung-fa, Helena Baturina, Alexander Lebedev, Onsi Sawiris, Bin Talal, Mohamed Ibrahim, Sheikh Mohammed Hussein Ali Al-Amoudi, Abdul Aziz Ghurair, Nasser Al Kharafi, Muhammad Yunus, Mian Muhammad Mansha, Salman F Rahman, Dewan Farooqui, Sandiaga Salahuddin Uno, Tarek Talaat Moustafa, Hassan Abdalla, Mohamed Mansour, Osama Abdul Latif, Mohamed Ali Harrath, Othman Benjelloun. 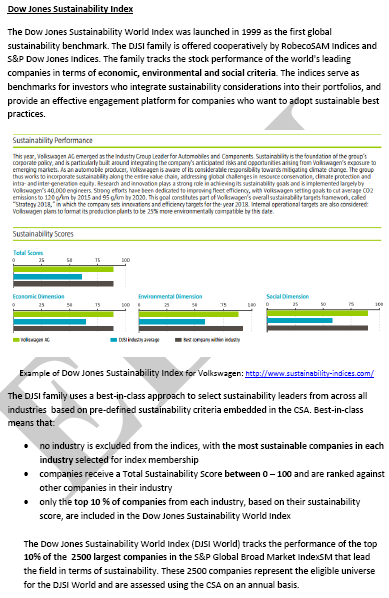 The Dow Jones sustainability index were created in 1999 as the first Global sustainability indicators. These indexes show the performance of the shares of the leading companies in the World regarding economic, environmental, and social criteria. Note: The objective of this Subject is not to analyse in depth the Corporate Social Responsibility, whose objectives would be away from the global vision of the project “Ethics, Religion and international business,” but provide a brief introduction to the CSR.